The controversy and disagreements often surrounding design competitions almost make us forget that competitions are an opportunity to examine a particular problematic that affects environment, innovation and heritage issues in equal measure: the architectural judgment. While the competition process is surely the most democratic way to grant contracts, the judgment process and evaluation of the projects remain to this day puzzling and downright incomprehensible. In 2010, the Notre-Dame-de-Grâce Cultural Centre (Montréal) competition organizers made the bold choice to open one phase of the judgment to the general public. The NDG Cultural Centre is part of a slew of public library competitions that includes Saint-Hubert Library Architecture Competition, 2008; Saint-Laurent Library Architecture Competition, 2009; Marc-Favreau Library Architecture Competition, 2009; Saint-Eustache Library Architecture Competition, 2010, and Saul-Bellow Library Architecture Competition, 2011. Since the current Notre-Dame-de-Grâce Library shares its space with the borough's cultural centre, the competition offered a mixed program: each project must integrate a library as well as an performance hall accommodating a resident dance troupe. Wanting to show the transparency of the competition process as well as raise the residents' awareness of architectural questions, Design Montréal and the competition organizers held a presentation session of the finalists' projects, which was open to the general public for the first time in Québec's history. This stage in the judgment proceedings is the last before the jury's closed-door deliberation period. In the next stage of the competition, the architects are asked to present their project to the members of the jury. At this point, the jury has been given a few days to familiarize themselves with the competitors' presentation panels and texts, and this exchange allows the jurors to deepen their understanding of the project, to ask questions and to gauge the architect or the team which will work with the general contractor. Although the public, who did not have the right to speak, much less vote, was not directly involved in the construction of the architectural judgment, it is difficult to say whether the hitherto unheard-of presence of an audience had an impact on the conduct of the presentation process, the discourse of the architects or even the critical eye of the jury members. It is equally difficult to predict how the public will receive this type of initiative. Despite the relatively low estimated audience of 50 to 60 people during this first attempt, it is important to mention that later competitions which followed the same formula, such as the Namur—Jean-Talon West Urban Design Competition (2011) and the Smith Promenade Urban Design Competition (2011), attracted a growing number of spectators (100 to 150 people). Without directly answering our questions, this clearly shows the growing interest of the residents in the architectural and urban fate of their neighborhood and city. While it is important to acknowledge the initiative to open one of the crucial stages of the judgment to the public, other aspects of the competition must be criticized for they send a contradictory message as to the willingness to show the transparency of the competition. Firstly, the competition was held in one stage, the finalists being selected on the basis of their portfolio. Is this practice, which forces architects have previous experience with the specific typology, really democratic? In contrast, in Switzerland all design competitions are open and anonymous allowing any architect to submit a proposal. Also, it has been more than two years since the announcement of the winner and the jury's judgment and the jury report remain to be published. This indeed makes us question the organizers' commitment to making the judging process more transparent. Finally, how is it that the Ordre des Architectes du Québec, whose competition guide clearly specifies that “after the launch of the design competition, the professional advisor must […] forward the competition's folder to the OAQ, including […] the jury report, with written confirmation of the acceptance of this report by each jury member” did not require this document which is essential to good practice in any design competition? Regarding the projects, the four teams stand apart by each deepening a particular theme. Chevalier Morales architects in consortium with Busby Perkins + Will developed a project based on the theme of the community in contact with public nature of the program. FABG architects' project is based on memory in connection with the historic Benny Farm neighborhood, built for war veterans. The approach chosen by Menkès, Shooner, Dagenais, Letourneux architects is based on a mediation between the existing architectural context and the modernity of the project. Ultimately, the jury chose to reward the project based on the theme of conviviality in connection with the spirit of community by Atelier Big City in consortium with Fischten Soiferman and associates and l'OEUF. Big City's text and presentation panels speak eloquently of their project, as each proposed architectural gesture has been carefully designed with the site in mind. The spaces and the architecture convene the future users to meet and to appropriate this new cultural centre of the neighborhood. One of the most glaring incarnations of these ideas is the exterior staircase, located in the middle of the façade, right near the bus stop. Despite several differences of opinion regarding this gesture, it must be judged on a social level more than an esthetic one. First and foremost, it affirms the public aspect of the building by inviting users to sit on the steps, use it as a rendezvous point, etc. The winning project thus surpasses mere spaces and functions and transforms into a livable object. 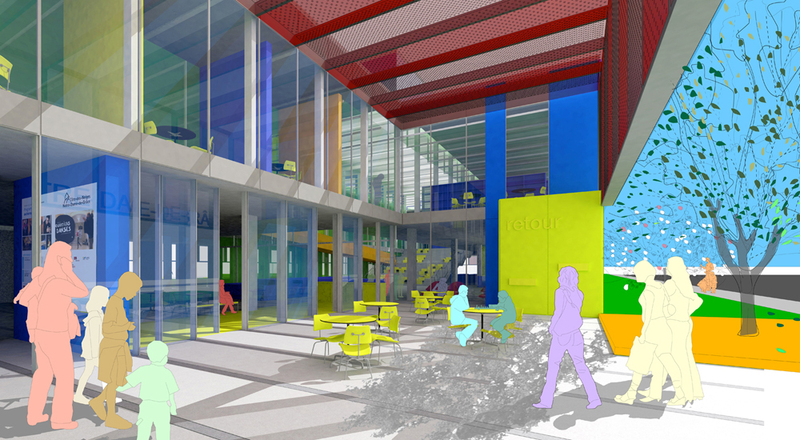 These design principles are developed throughout the project, be it at the entrance, where the limit between the interior and exterior of the library is blurred by a space covered by a perforated surface (which in the summer houses the café's terrace), inside the actual building, where the sections reserved for children, teens and adults allow visual connections while each enjoying a separate treatment, or even by the presence of the large central platform (which doubles as the main staircase), where one can read alone but never be lonely. More literally, the architects also imagined an edible garden where apple, pear and plum trees can grow at the rear of the building. In conclusion, this library, which is scheduled for completion in 2014, is a first for Big City. They have participated in similar competitions for Alexandria Library (1989), Outremont Library (1995), Châteauguay Library (2002), Charlesburg Library (2003) and Félix-Leclerc Library (2007) without success. The recognition of the jury in this instance is even more important for Big City, for it is a one-stage competition where finalists are selected based on their experience drawn from previous completed projects of the same typology. Therefore, it may be “one step forward, two steps back” for the Notre-Dame-de-Grâce Cultural Centre, but a double victory for the winners. This competition involves providing Montreal's Côte-des-Neiges  Notre-Dame-de-Grâce neighborhoods with a new cultural hub, consisting of a merger between a library and a multifunctional cultural center. Intention within architectural expression is the key of the project. Coherence and specific expression are the objectives behind this architectural intention, revealing a unique and integrative vision of the project. The outcome allows the jury to determine the architectural intention that best reflects a balance sought by the expression of the merger between the elements of the architectural program. The different spaces of the project, which include the entrance hall, the multipurpose room, technical and administrative services, must permit a certain synergy allowing development and influence worthy of a contemporary cultural center. At the center of the project, the architect is in charge of integrating a number of parameters while maintaining a single architectural outlook. This role allows the architect to integrate a number of perspectives on a number of different scales throughout the design process.